Designer, teacher, writer, and illustrator Franklin Habit is the author of I Dream of Yarn (Sixth&Spring Books), It Itches: A Stash of Knitting Cartoons (Interweave Press, 2008) and proprietor of The Panopticon (the-panopticon.blogspot.com), one of the most popular knitting blogs on the Internet. On an average day, upward of 2,500 readers worldwide drop in for a mix of essays, cartoons, and the continuing adventures of Dolores the Sheep. Franklin’s varied experience in the fiber world includes contributions of writing and design to Vogue Knitting, Interweave Knits, Interweave Crochet, PieceWork, Twist Collective; and a regular columns and cartoons for Knitty.com, Ply magazine, Skacel Yarns (Fridays with Franklin), and Lion Brand Yarns. 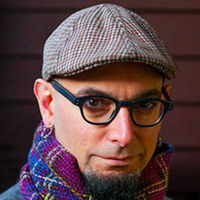 Several of his independently published designs are available via Ravelry.com. He travels constantly to teach knitters at shops and guilds across the country and internationally, and he has been a popular member of the faculties of such festivals as Vogue Knitting LIVE!, Stitches Midwest and East, and the Madrona Fiber Arts Winter Retreat.